'Dwarf Green Curled' is a very compact, hardy and easy to grow kale. This dwarf variety grows to 30 to 45cm (12 to 18in) tall and produces an abundance of tender and delicate, densely curled green leaves which can be harvested throughout the winter months. It is ideal for windswept or small gardens. 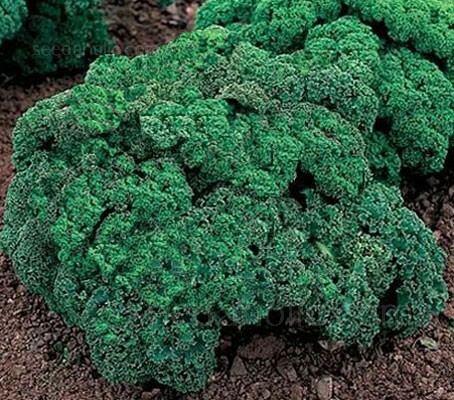 Introduced before 1865 and popular ever since, it was once also known as ‘Dwarf Curlies’ or 'Scotch' kale. The frilly, dark green, sturdy leaves are often mistaken for an ornamental garden plant and can create an exciting backdrop in flowerbeds. As winter crops, kale can't be beat, it is one of the least problematic and hardiest plants in the wide and varied Brassica tribe. It is immune to most of the disease that trouble many Brassicas including pigeons. Their major value to gardeners is providing delicious, highly nutritious greens when the weather is far too cold for other vegetables. Kale is extremely cold hardy, The flavour actually improves after a hard frost and it will tolerate conditions that would make most brassicas keel over. A “cut and come again” crop, leaves can be harvested as needed throughout the winter. The tasty leaves can be added to soups, stir-fries, streamed, or simply finely chopped and added to salads for a nutrition and fibre boost. Harvest: Matures 53 to 65 days from transplant. The best recipes will be found in Italian cookbooks. It goes well with: Pork, Pumpkin, Chickpeas, Pecorino, Pasta, Venison, Lamb, Garlic, Mushrooms. Boil, steam or stir-fry. Nutritionists would label it a super-food, rich in iron and vitamins. Kale is a Scottish word derived from coles (Greek) or caulis (Roman), terms that refer to the whole cabbage-like group of plants. The German word kohl has the same origin. With their loose leaves, Kale are the most primitive members of the cabbage family and considered to be closer to wild cabbage than most domesticated forms. Their origins are in the eastern Mediterranean area and Asia Minor. Kales have been food crops since about 2000 B.C. In Europe, kale was the most common green vegetable until the end of the Middle Ages. The species Brassica oleracea contains a wide array of vegetables including broccoli, cauliflower, collard greens, and Brussels sprouts. The cultivar group ‘acephala’, meaning ‘non-heading’, also includes spring greens and collard greens, which are extremely similar genetically. Scotch types have very curled and wrinkled leaves, Russian (or Siberian) types are almost flat with finely divided edges, while Italian heirloom ‘Lacinato’ is in a class of its own. Japanese kale, also known as Ornamental Brassicas is primarily used for decorative or ornamental purposes. Matures 53 to 65 days from transplant.